A bathscreen is the perfect solution if you don't have room for a dedicated shower enclosure. 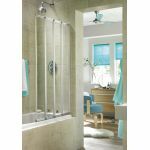 The addition of a bath screen to any bath instantly transforms it into a practical showering space. 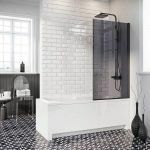 Forget the flimsy shower rail with tacky curtain that sticks to your skin and enjoy a designer shower screen that is far better at preventing water leakage.